When Friday's best friend, Rosie, discovers Friday is risking further emotional pain she convinces her to end the relationship and join a dating website. But not long after Friday dives into the world of online romance she starts taking wrong turns. Could one of her flings have become a little too obsessed with her? And has the time come to step back and take a good look at where she's going in life? Lisa Heidke studied journalism at Queensland University, fled Brisbane and settled in Sydney where she landed a job as an acquisitions editor in book publishing. After a while she swapped book publishing for magazine publishing, working as a feature writer on several national magazines. After many years living in Sydney's inner west, Lisa woke up one morning to find herself living with three children on the North Shore (much to her surprise and sometimes horror). She is the author of Lucy Springer Gets Even, What Kate Did Next, Claudia's Big Break and Stella Makes Good. Question: What inspired the story of It Started with a Kiss? Lisa Heidke: My imaginary character, Friday Jones, was going through a marriage break up around the time I was (funny, that!) and after I started thinking -how do newly single women find themselves again?' Not necessarily their sexual lives, but just themselves and their identity? After you've been with the same partner for twenty plus years, how do you go about meeting new people to discover who you are? Question: What was the best thing about creating the character of Friday Jones? 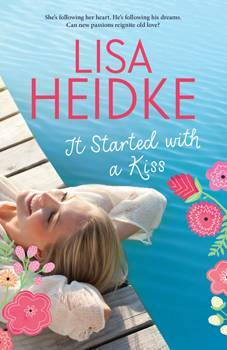 Lisa Heidke: Even though Friday is flawed and going through a tough time personally, I was able to write her as an inspirational character rather than a tragic one. Yes, she falls down several times and works hard to pick herself up, but Friday is ultimately optimistic about her life. Online dating takes centre stage in the novel when Friday joins KissMeCupid.com and that leads to a few humorous and embarrassing scenes. To add to the dram, Friday's best friend, Rosie, runs a divorce party business. Researching that was a lot of fun. I hope Friday's journey will resonate with readers and they'll realise they're not alone and that there's light at the end of the tunnel. Question: Can you talk about your dating website research? Lisa Heidke: I have friends whose marriages and long term relationships have fallen apart and suddenly they find themselves alone and lonely. How do they meet people? Quite a few have gone on dating sites like RSVP. And I thought it would be a good premise for a story. I interviewed friends who have dived into online dating and was enthralled with the concept – how it works (and often doesn't! ), the successes and the horror stories. I loved exploring this aspect of It Started with a Kiss and will admit I joined RSVP and e-harmony - purely for research purposes. In the main, I was upfront with people and told them what I was doing. Some people were really generous with their time and experiences, others shut me down immediately. I was fascinated by the number of people who happily admitted to posting photos of themselves that were at least ten years old, who lied about their age, height, and occupation, to the point of totally reinventing themselves. And to what end? Surely the facade can't continue once they meet their -dream' man or woman in person. Incredibly eye opening! Lisa Heidke: Initially, a lot. But whist inspiration might come from real life and real people, once I've played around with those character traits and embellished, rewritten and embellished again several times, my fictional characters don't resemble any people from my real life. Question: Are you able to share anything about your next book, with us? Lisa Heidke: Yes, tentatively titled Sabrina's Second Shot, this story centres on two sisters playing in the fast paced world of professional tennis – Sabrina, ambitious and determined; and Annie, two years younger, talented but vulnerable. Things go dramatically wrong when Annie's boyfriend publically announces their engagement at the Australian Open. Meanwhile the sisters' handsome and dedicated coach, Bear, is doing all he can to keep the women focussed and on track. He also harbours a not too secret crush on Sabrina. It's been a lot of fun to write. I have loved writing about the sisters' relationship. It's quite volatile. But I think it's balanced by the humour and romance. I have a bit of a crush on Bear, myself.